Make your parking lot ADA Compliant with our ADA Handicap Stencil. 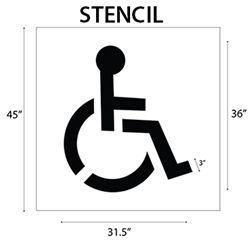 Our Wheelchair Pavement Stencil is 45” in overall height with a 36” Wheelchair Symbol. The ISA Stencil is also easy to use to mark off and create a white 4” border when required. California Standard: An ISA with the wheelchair pictogram of at least 36 inches, should be outlined in white, and painted at the rear of each wheelchair-accessible parking space, so it can be seen under a parked car; with the required 4” borders, the entire image will be larger than 36” x 36” ISA.